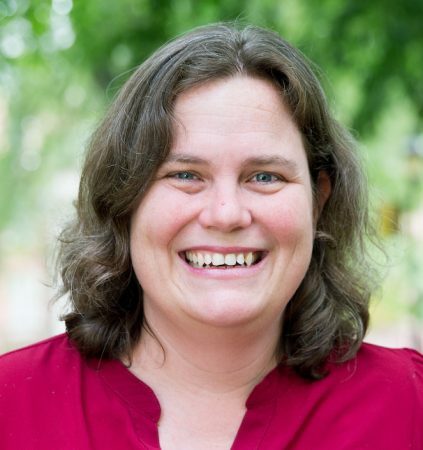 The Randolph College Board of Trustees recently approved Sarah Sojka, a physics and environmental studies professor, for tenure. She was also promoted from assistant to associate professor, effective July 1. Prior to coming to Randolph in 2013, Sojka received her undergraduate degree in environmental studies-public policy from Eckerd College and her master’s degree and Ph.D. in environmental sciences from the University of Virginia. She has conducted extensive research on water quality and how physical processes affect the biological processes in shallow coastal systems. Specifically, she has worked with Randolph students on several Summer Research projects on rainwater harvesting systems and coastal seagrass restoration. In addition, she has taught students how to use ground penetrating radar (GPR) technology to conduct archaeological research on historic sites like Stratford Hall, the birthplace of Robert E. Lee. Outside of the classroom and the lab, Sojka serves as faculty liaison for Randolph’s women’s lacrosse team.